Royal Caribbean decided the first two of what were formerly referred to as their Project Genesis ships will be named Oasis of the Seas and Allure of the Seas, in that order. The class of 220,000-ton vessels will henceforth be referred to as the Oasis-class. The names were chosen as part of a contest where individuals were invited to submit names. The winners were chosen by a panel of judges which included Lauren Teton, founding partner of Name One!, which specializes in finding unique names for products and business entities; John Maxtone-Graham, maritime historian, lecturer and author of numerous books; and Albert Mehrabian, Ph.D. Professor Emeritus of Psychology at UCLA and author of more than 14 books, including "Baby Name Report Card: Beneficial and Harmful Baby Names." Frankly, with a panel of judges that oozed so much imagination and brainpower, we would rather have seen Royal Caribbean employ them to create the perfect names for these high-profile ships rather than completly abdicating the line's creative responsibility. The complete article appeared in the May 23, 2008, edition of Cruise News Daily. It's the Memorial Day Weekend in the United States. In case your plans get rained out, we came across some interesting reading for you, appropriately about the SS United States, the classic American oceanliner, laid up in Philadelphia still seeming to be just waiting for its chance to sail again. Over the past several weeks, there have been a couple of articles published about the legendary ship, which is still owned by NCL or some division thereof. And the final entry into the SSUS trifecta is a PBS special called "SS United States: Lady in Waiting." As with most PBS shows, they appear in your area when your local PBS station decides they should, and if PBS is smiling upon you, this production will be running in your area this weekend. If not, you can get a preview at the production company's website at http://www.bigshipfilms.com/ and watch a 3-minute preview. You can also purchase a DVD of the complete show at the same website. As noted in the stories, Norwegian Cruise Line still owns United States, and they hold the keys to its future. Recently when we talked with NCL CEO Colin Veitch, he told CND that United States "is still there as a viable option for us - or for someone else." The Popular Mechanics article seems to indicate that the possibility looms for United States being scrapped, and bases some of that on the fact that NCL recently sold Independence and Norway. Norway was, of course, sold when it was finally determined that it could not be put back into sailing condition after its accident for a reasonable amount of money that could make it profitable. It was later resold for scrap. United States and Independence were purchased by NCL at the outset of the NCL America operation as an investment in their future. Since the two ships were American-built, it was about the only way the company could ever expand its American-flagged fleet, short of getting another Congressional exemption, which seemed unlikely. Veitch said right from the start that they wouldn't be actively working to rebuild those ships or put them into service until NCLA was operating profitably and there was a need for them. He was also very candid in saying that Independence's future was more cloudy than United States. Less was known about Independence, since over the years, there had been more engineering studies done on United States. Since the two ships were purchased by NCL, we've spoken with Veitch regularly about them. He's always said that it was rather questionable if Independence could ever meet maritime codes and ever sail for NCLA, but they have maintained it until last February when it was sold. He told CND at that time that "with the retrenchment of our modern-ship fleet in Hawaii, we could see no prospect of using the Independence again." The purchaser has towed the ship toward the Middle East and insists that it is not being scrapped but has never made any plans for it public. "[United States' status] is different," Veitch told CND. "We are looking at what to do with United States now. United States has much more of a name than Independence had and is frankly in much better condition than Independence was. The prospects for United States are ... different," he said. Again, over the years, each time we've talked about United States, he's said that each step that has been done in studying the ship has shown them that bringing the ship to meet current passenger expectations and making it meet current maritime codes is a viable option which can be done at a cost that will allow them to operate it profitably. There are still more studies to be done, however, before they are certain of it. NCL has been taking their time having those done because there's no need for the ship at this point. Once a need can be seen on the horizon, then we can expect to see things move more quickly in determining the overall viability of the project. But unlike the tone of the Popular Mechanics article, Veitch doesn't seem to see United States heading off to scrap. "United States is an intriguing enough property that we're still interested in it, and from time to time we get inquiries from others who are interested in it," Veitch said. That hasn't been the case with either of the other two classic ships they have sold. So if United States never sails for NCL America, it will probably end up in someone else's loving possession to restore. Princess Cruises has published a new video about Alaska that is quite different from your normal travelogue. While most of travel videos show you the top sights and invite you to come to the destination, this one seems to be saying, "Come back." This one seems to be created for people who have already been there. "The Heart of Alaska" is the first video that was produced in-house by Princess in a series about their major destinations. There is no description or travel information accompanying the gorgeous photography. The complete dialogue is Alaskan citizens telling you what they love about Alaska. It's quite a departure from the norm. The video will be shown on Princess ships in Alaska and in the Princess Wilderness Lodges in the state. It will also be available for purchase only onboard the Princess ships in Alaska. The complete story appeared in the May 22, 2008, edition of Cruise News Daily. After pleading guilty a couple of weeks earlier to the federal misdemeanor charge of grossly negligent operation of a vessel, in the Norway boiler explosion, the judge in the case set the fine for Norwegian Cruise Line at $1 million as part of the negotiated plea. The ruling, which essentially wraps up the incident, came just three days short of the fifth anniversary of the explosion which occurred just after the classic ship had docked in Miami and took the lives of eight crew members and injured ten others. The judge's ruling also formalized the $13.75 million in settlements NCL has already paid to the injured crew members and their families. SS Norway has since been withdrawn from service and is currently being broken apart in India. The complete article appeared in the May 22, 2008, edition of Cruise News Daily. Like most major cruise lines, MSC Cruises participates in the local life of their port cities. A more unusual example of that participation is in Capri where they have an annual "Cow Parade" of fiberglass cows interestingly attired or decorated by well-known artists, sponsored by local businesses, and placed throughout the central city. MSC Cruises sponsored two this year, and "MSC Yacht Club" is shown at left. 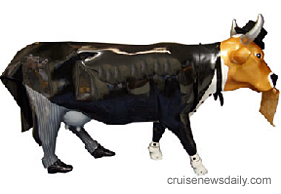 The Cow Parade began in Capri in 1998 and has since been copied by more than 40 cities around the world. The annual two-month event this year runs through July 11. The article originally appeared in the May 22, 2008 edition of Cruise News Daily. Two couples in England are threatening to sue P&O Cruises over the "maiden voyage" of Ventura. They were on the two-week Mediterranean cruise from Southampton that left the same evening that Dame Helen Mirren christened the ship. They said they booked the cruise because they've always wanted to be on a ship's first cruise and claim they paid a premium for it. They are unhappy because the ship was delivered to P&O a bit early and the line added a previous two-night cruise to Belgium which was open to the public. The couples claim that was actually the "maiden cruise." The unhappy couples claim the maiden cruise was the first cruise on which paying passengers were carried. The line claims the maiden cruise was the first one after the christening. In the CND article, we looked at the issues surrounding the situation. The complete article appeared in the May 21, 2008, edition of Cruise News Daily. As part of their Cunard Insight enrichment program, Cunard has scheduled legendary entertainer Bob Hope's daughter, Linda, to sail aboard Queen Mary 2's September 4, 2008, transatlantic crossing. During the voyage, she will host several events and share a look back at her famous father's life. A collection of Hope's personal items, which will be auctioned in October, will also be on display during that voyage. Hope was a frequent passenger aboard the line, and the items will include not only items connected to his travels, but also iconic possessions. More information on the auction and the items is available at http://www.juliensauctions.com/. The first part of a two-part video interview with Carnival Corp Chairman Micky Arison has been posted on Carnival Cruise Lines' travel agent website. While it is directed at travel agents, non-travel agents may also find it interesting actually hearing him talk about the early days at Carnival when "survival was our number-one priority." There was more excitement on Norwegian Dawn the afternoon of May 20 when someone spotted a body in the water. The incident came on the cruise following one on which a woman went overboard and was not found. In this case, the ship again turned around, put rescue boats in the water and began searching. As they searched, it was unspoken, but the missing woman was on everyone's mind. Wouldn't that have made a spectacular end to the story? After about an hour, they found only a large piece of wood floating in the ocean which it was assumed that was what was seen from the ship, and the ship continued on to Bermuda. The complete story appeared in the May 20, 2008 edition of Cruise News Daily. All 12 ships in the Costa fleet will be carrying the UEFA Euro 2008, European Football Championship matches (soccer). The matches will be played from June 7 through June 29 in Austria and Switzerland, and Costa passengers will be able to watch every one of them live. It may not seem like a big deal to Americans, but to Europeans it is like three solid weeks of nonstop Super Bowl weekends. The matches will be shown in each ship's largest venue, and on Costa Serena and Costa Concordia, that means on their giant outdoor screens. 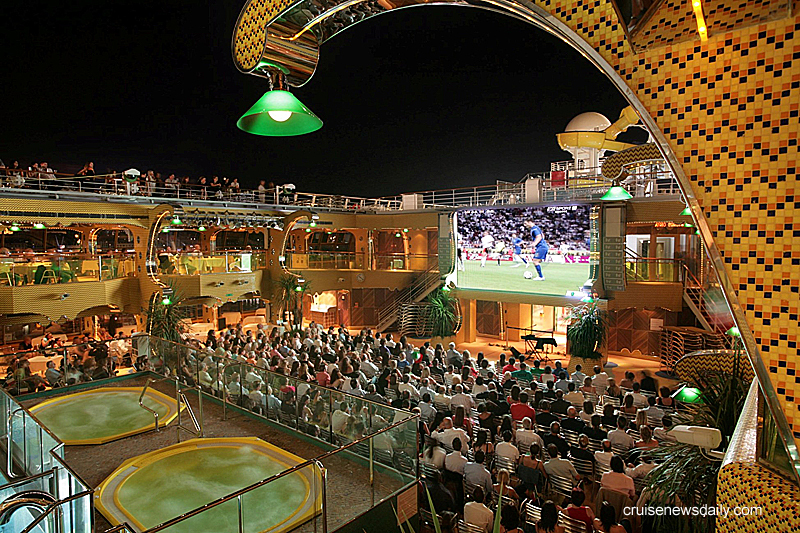 The photo shows the crowd of more than 2,000 passengers gathered to see the World Cup final during Costa Concordia's Lido Deck during the ship's inaugural cruise. 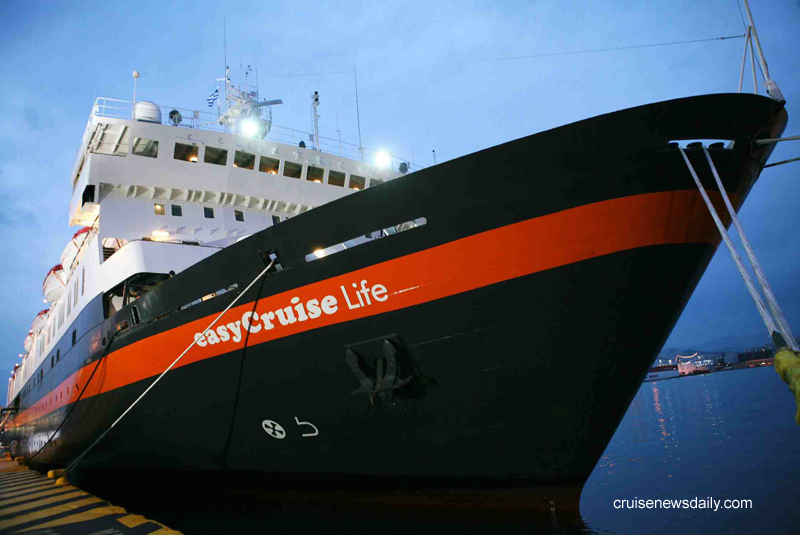 easyCruise added a second ship to the fleet when easyCruise Life entered service May 17 almost a month late due to an ongoing labor action at the Greek shipyard where the €20 million refit was taking place. The ship will initially be operating Greek island itineraries. The ship is almost twice the size of easyCruise One. The line said they have shelved their previously-announced plans for newbuilds for now, and are instead looking for another similarly-sized ship to replace easyCruise One. In the CND article, we looked at how different the two ships are and how they represent the evolution of the easyCruise concept. The complete article appeared in the May 19, 2008 edition of Cruise News Daily.